ClarkVision Photograph - Look! I've got a Stick! Look! I've got a Stick! 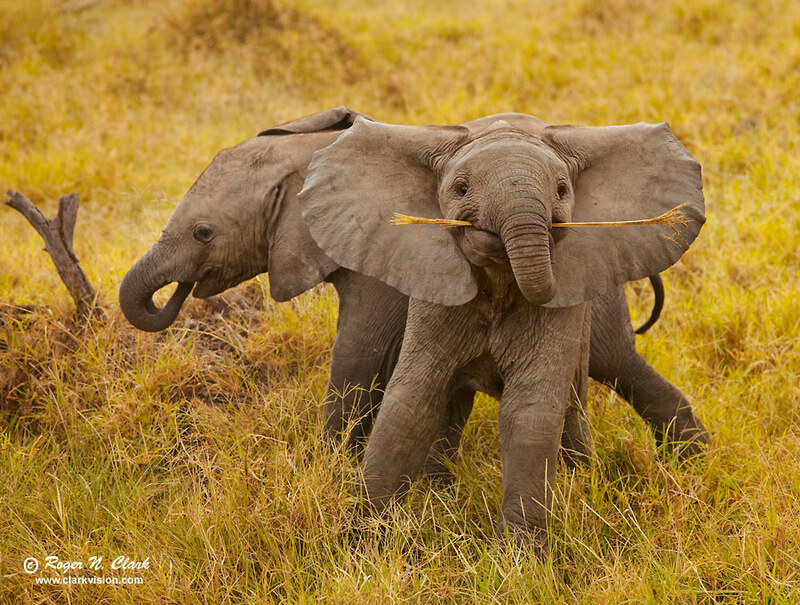 Baby elephants at play late one afternoon in Lake Manyara National Park, Tanzania, Africa. Lake Manyara was extremely dry with few animals, but there was a herd of beautiful elephants and I spent a lot of time with them. The challenge was getting them isolated from the clutter of the vegetation, and other elephants. The light was bright thin overcast in the late afternoon, with light reflecting off of the dry vegetation, resulting in wonderful warm light. The adult elephants were grazing while the babies played. This baby was turning to show his mother the stick he had collected and was not paying attention to me. This image is a Highly Honored photograph in the 2010 Nature's Best Photography Windland Smith Rice International competition. Technical: Canon 5D Mark II 21-megapixel camera, Canon 500 mm f/4 L IS lens plus a 1.4x teleconverter giving 700 mm at f/5.6. Exposure: 1/250 second at ISO 400, f/5.6. Image cropped to 16.7 megapixels.